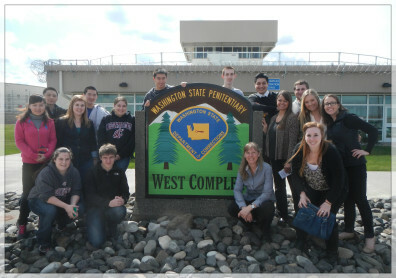 Alpha Phi Sigma, the Criminal Justice Honor Society, organized a trip to the Washington State Penitentiary in Walla Walla, WA this past April. Undergraduate students toured the maximum, medium, and low security units and interacted with inmates in the Sustainability Unit where inmates reclaim and recycle used bicycles, wheel chairs, furniture, and wood products. These items are saved from the landfill, refurbished, and then redistributed for use within the Department of Corrections, saving taxpayer money. The items are also donated to community groups to serve populations in need such as foster care children, the elderly, and those experiencing hard times. The tour served as a great educational opportunity providing students with a chance to observe firsthand the expertise needed to manage and work with offenders incarcerated in our state. 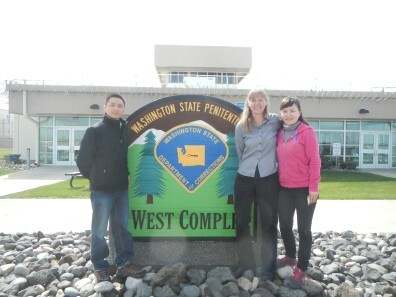 Alpha Phi Sigma and our department’s visiting scholars at the Washington State Penitentiary in Walla Walla, WA. Faith Lutze with our Chinese visiting scholars, Du Fang and Eurgie Hu.